At safetime® we are offering clients a chance to stand out from the crowd with their scaffolding inspections. Inspect7® has revolutionised health & safety reporting by becoming a leader in digital scaffolding inspections. Using a visible tagging system to supplement scaffold inspection reports is a useful way of ensuring those who need access to the scaffold/temporary work know that it has been inspected correctly and therefore safe to use. Although tagging systems are not a legal requirement, the law does require an inspection of scaffolding, as well as the issue of a report by a competent person on a weekly basis. 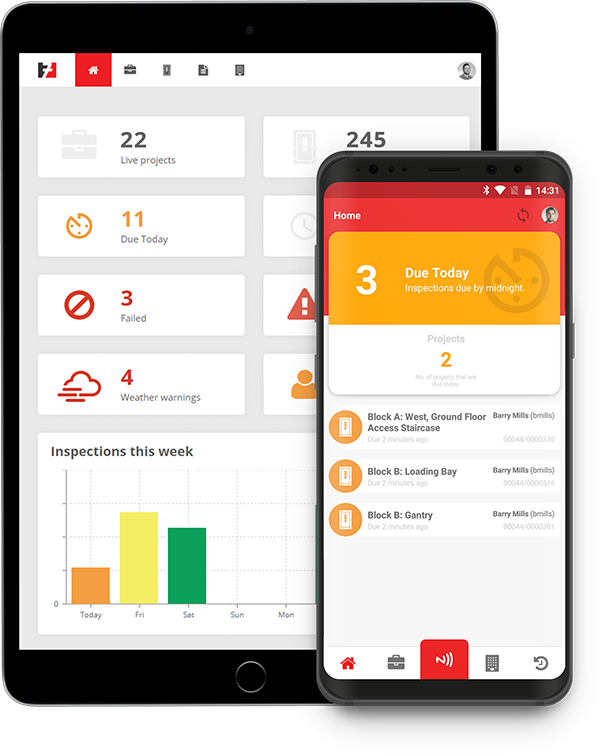 As a result, the Inspect7® device displays a visual 7-day countdown timer to ensure a weekly inspection of the scaffolding/temporary works is never missed. This small but perfectly-formed device is a really clever tool that can give many of us peace of mind and a means of checking site activity performance from our offices. Sync inspection data instantly to the Inspect7® portal for team collaboration. Get an accurate location of all your live devices and projects. Receive a daily digest of due scaffolding inspections, as well as any updates. Full access to the Inspect7® online portal for up to 5 users. Bad weather? Make the decision whether the scaffold needs re-inspecting. Download in-depth scaffold inspection reports to PDF or CSV. Upload a photo or make a comment while carrying out scaffolding inspections. Receive full hardware and software training free of charge.